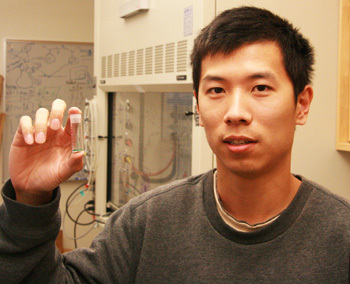 Graduate student Honghan Fei holds a sample of SLUG-26, a new material developed by Fei and chemist Scott Oliver (below). Photos by T. Stephens. Water softening techniques are very effective for removing minerals such as calcium and magnesium, which occur as positively-charged ions in "hard" water. But many heavy metals and other inorganic pollutants form negatively-charged ions in water, and existing water treatment processes to remove them are inefficient and expensive. Chemists at the University of California, Santa Cruz, have now developed a new type of material that can soak up negatively-charged pollutants from water. The new material, which they call SLUG-26, could be used to treat polluted water through an ion exchange process similar to water softening. In a water softener, sodium ions weakly attached to a negatively-charged resin are exchanged for the hard-water minerals, which are held more tightly by the resin. SLUG-26 provides a positively-charged substrate that can exchange a nontoxic negative ion for the negatively-charged pollutants. "Our goal for the past 12 years has been to make materials that can trap pollutants, and we finally got what we wanted. 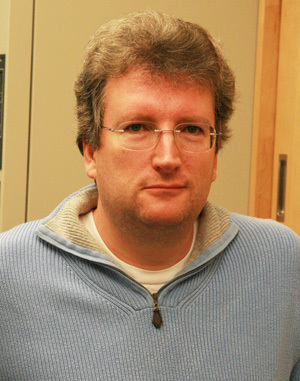 The data show that the exchange process works," said Scott Oliver, associate professor of chemistry at UC Santa Cruz. The chemical name for SLUG-26 is copper hydroxide ethanedisulfonate. It has a layered structure of positively-charged two-dimensional sheets with a high capacity for holding onto negative ions. Oliver and UCSC graduate student Honghan Fei described the compound in a paper that will be published in the journal Angewandte Chemie and is currently available online. The researchers are currently focusing on the use of SLUG-26 to trap the radioactive metal technetium, which is a major concern for long-term disposal of radioactive waste. Technetium is produced in nuclear reactors and has a long half-life of 212,000 years. It forms the negative ion pertechnetate in water and can leach out of solid waste, making groundwater contamination a serious concern. "It's a problem because of its environmental mobility, so they need new ways to trap it," Oliver said. In their initial studies, the researchers used manganese, which forms the negative ion permanganate, as a non-radioactive analog for technetium and pertechnetate. The next step will be to work with technetium and see if SLUG-26 performs as effectively as it did in the initial studies. "Whether or not it can be used in the real world is still to be seen, but so far it looks very promising," Oliver said.